In a small dutch oven or medium soup pot bring non dairy milk, water to a boil. Salt to taste and add shells. Reduce to a simmer and cook, uncovered for 8 minutes. Reduce heat to low and add baby spinach, stir until wilted. Add quartered Coconut Herb Chao Cheese Slices and stir over low heat until melted. While the pasta is boiling, place bread slices and sausage link in a food processor and pulse until crumbs begin to form. Add whole grain mustard and pulse a few more times. Add vegan butter and pulse until pea sized crumbs begin to form. If using a small dutch oven sprinkle the sausage crumble directly over the mac n cheeze. Place in the oven on the top rack and broil on low for 5-8 minutes, or until golden brown and bubbly. If mac n cheeze was cooked in a soup pot, transfer mac n cheeze mixture to an oven / broiler safe dish, then sprinkle with sausage crumble and broil on low for 5-8 minutes. Remove from oven, allow to cool for 3-5 minutes then enjoy! They're just sorcerers over at Field Roast, that's all there is to it. Everything they make is incredible, but that coconut herb cheese is the greatest. 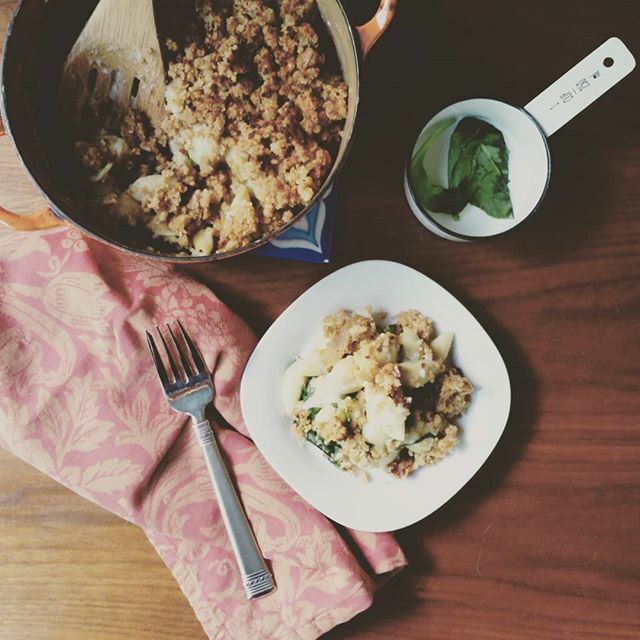 Always up for ideas on spicing up mac 'n cheese and this crumble on top is just the thing! Why have I never done this before? Awesome! Cool I absolutely love mac n cheese. This is perfect! Perfect dish to add to your meal prep menu. Thank you for sharing! Oh my, I'm so sorry I haven't visited your blog sooner. I took a year off from blogging and I've been back at it for just a little while now, but I've missed your blog! Renovating sounds exciting! Although I can imagine it takes most/all of your time :) we're planning on renovating next year, and I'm so not prepared for how the rest of my life is going to suffer, haha. I'm going to go check out your Instagram. Oh, and your mac and cheese sounds so delicious! Heidi I was SO excited to see you on instagram!!! I was just over at your blog wondering where you have been :) Sometimes a little break is a good thing :) Renovating has taken up 99% of our time, I have missed blogging on the regular and am still trying to figure out my new light and set up at the new house :) So happy you are back blogging and can't wait to see your reno progress!